Huawei Technologies has committed itself to start testing 5G technology in a memorandum of understanding signed between the government and the Chinese company. 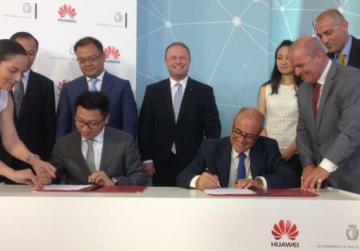 The agreement was signed at the small office Huawei is occupying at Smart City, which was inaugurated today by Prime Minister Joseph Muscat. Also taking part in the ceremony were, Parliamentary Secretary for Competitiveness and Economic Growth José Herrera, Sai Mizzi Liang, Investment Envoy for Asia, and Edward Chan, CEO Huawei Italia. Joseph Cuschieri, the technical expert leading the discussions with Huawei, said discussions started in July last year when a Maltese delegation including Ms Mizzi Liang, who facilitated the discussions and helped in communications, went to China for the purpose. "You finally found me... Don’t believe everything you read about me online. This is the real me. I want to tell you what I do for you. I manage and develop Malta’s relationship with the largest economy in the world. I promote Malta in China and bring business back to Malta." She said that hi-tech companies tended to cluster, as was the case in California, and this could also happen in Malta. "Other companies are competing for Chinese investment. We can do what Malta has always done and embrace the outside world or we can shut ourselves off. Let's embrace this opportunity," she said. The main priorities of the memorandum include a commitment by Huawei to start testing 5G technology - the most advanced mobile technology currently available. This includes internet speed more than twice as fast as 4G. It also has various other applications including for traffic management systems. Huawei said that Malta’s size was an advantage for them for testing. The 5G testing forms part of Huawei’s five-year plan that started in 2013 to invest $600 million in research on the next phase of mobile phone networks. The company is also in agreement with the government over the priorities of the Digital Malta strategy, which includes a nationwide fibre to the home project and the laying of another submarine cable. Mr Cuschieri pointed out that a number of local operators were already exploring fibre to the home and Huawei would not be given any market advantage but would be competing like everyone else. The government would work with the private sector to avoid duplicate investment. He said that, at the moment, local operators were all in localised areas whereas the government wanted all of Malta and Gozo to be covered. Huawei would also consider the setting up of a disaster recovery centre as a backup for its investments in the north African region, which could be facing political problems and instability. The company currently has a handful of people working at its Malta office. Mr Cuschieri said that Huawei acknowledged the special relationship between the Maltese and the Chinese governments and the aim of that relationship was to lay the foundations for the future. Huawei had 9,900 employees in Europe, having established its presence in the continent in 2000. Last year, it signed more than 200 technical collaboration agreements with European partners, participated in 17 framework programme and Horizon 2020 projects, and cooperated with over 160 European scholars and experts as well as more than 120 academic institutions. Mr Edward pointed out that, last year, Huawei spent $6.6 million dollars on research and development and developed innovation centres in Spain and Italy to work closely with customers. Huawei, he said, could carry out testing on 5G with the Maltese government in preparation for when the technology became commercially available. Speaking on the relationship between the government and Huawei, Dr Herrera said it would raise the bar for the whole sector in Malta. Malta guaranteed a risk free environment for high profile brands and already hosted 200 world class companies. The agreement would future proof the ICT sector in Malta, he said. “Through their innovative strategies, Huawei would bring something special to Malta boosting our digital economy. The market is there and so is the opportunity. Dr Muscat said the agreement proved that size was not an obstacle. He said the government would continue to work to attract foreign investment both from Europeans partners as well as partners from India, Singapore, the Gulf and other areas. "For Malta this means not catching up to the future but being ahead of the rest in testing the future," he said.